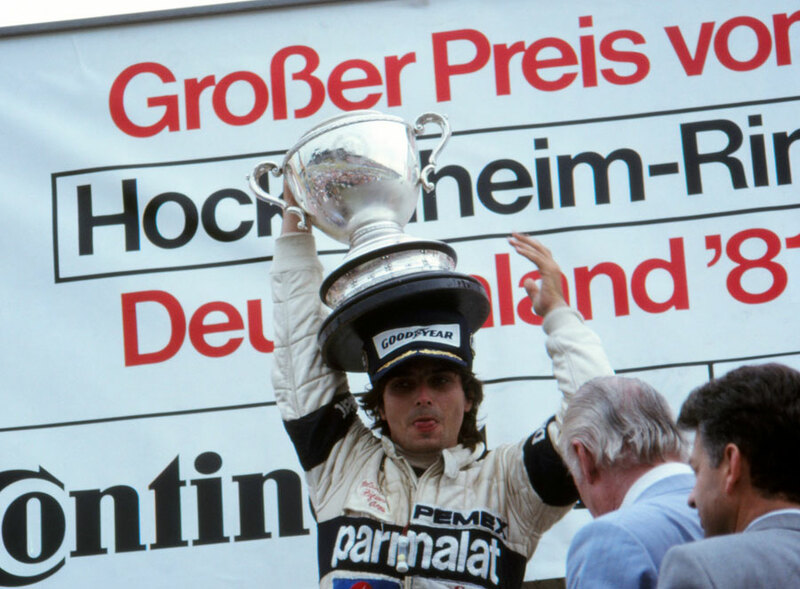 Nelson Piquet put his championship aspirations back on course with victory in the German Grand Prix at Hockenheim. The circuit was expected to suit the turbos more than the normally-aspirated engines, and so it proved in qualifying. For the second race running the Renaults occupied the front row of the grid but were dogged by mechanical issues and a communication breakdown. Alain Prost led Carlos Reutemann away from the line and Didier Pironi ran third in his Ferrari while Alan Jones was trapped in fifth behind the slow-starting Rene Arnoux. Jones made up the lost ground and passed Reutemann on the fifth lap - Reutemann's Williams was in trouble and eventually retired, leaving Jones to attack Prost for the lead. Jones harried Prost but the Renault had enough straight-line speed to stay in front, and Piquet soon joined them. It then went badly wrong for Renault. As Prost closed on team-mate Arnoux, the idea was he could pass while Arnoux would then try to delay Jones and Piquet. But Jones anticipated the situation and shot between the Renaults, with Piquet following suit. Jones maintained his lead in increasing drizzle, but then his Williams began to struggle with a misfire, as it had done at the British Grand Prix. He eventually pitted and although he resumed he finished down in 11th. Piquet made the most of Jones' ill-fortune to secure the win with Prost and Jacques Laffite rounding out the top three. John Watson finished sixth in the reserve McLaren, his switch coming minutes before the race when it was discovered his first-choice car was burning too much oil. Yet again Gilles Villeneuve's Ferrari acted as a traffic block, and at one point he clashed with a frustrated Nigel Mansell. Mansell continued before he pitted in his Lotus to change a wing but was immediately retired when he revealed he had burns caused by a leaking fuel tank. Piquet had been bothered by an ankle injury he had suffered in his crash at Silverstone a fortnight earlier, and also had to overcome handling issues on the day. "Early on I ran over a piece of aluminium dropped from another car and it damaged the left-hand skirt of my Brabham," he said. "This badly upset the balance of my car and I had to drop back while I developed a driving technique to cope with the problem."